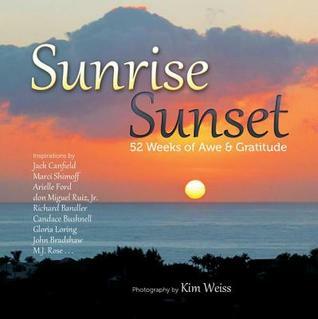 Sunrise Sunset is both a coffee-table book and an ‘inspirational’ book. Photographer/editor Kim Weiss pairs her photographs with poetry and reflections meant to capture the awe and gratitude of our lives. There is much to like here, and this will certainly be treasured by many. I, however, was a bit underwhelmed. Enjoying the beauty of a sunrise or sunset is not something I take for granted, and my children could tell tales of our being in a rush to get somewhere and I’ll pull the car over to take the time to sit and enjoy a beautiful sky. But for the sake of a book, I felt that there was a ‘sameness’ to the bulk of the pictures. Before turning each page, I could predict where the horizon would be in the photo; where the water-line would end and the tips of trees might be; where the clouds would be in the sky; etc etc etc. There were some pictures that were breath-taking, but for a book that is essentially a photo-book, I was hoping for a few more. My favorites were those on pages 78 and 105, mostly because of how different they were from the others. Were I to read this book in the intended manner … a two-page spread a week … I may not have felt the same-ness. Instead I read this book over the course of a week and the consistent appearance was very apparent. The reflective writings were brief and touching and from a wide range of writers, from Reverends to Rabbis. I’m not one to read devotionals or brief inspirational writings, but I recognize their value to many readers and these seemed generally apt for the book (though occasionally I wondered at why something was chosen). This is a nice book, and will see its s of readers, but it’s not a book I can rave or recommend. Looking for a good book? If you like coffee-table inspirational books, this is the just the sort you’re looking for.